1813 document showing where the Trustees of Warren Academy, at Warren, Maine, paid Thomas Starrett $1.40 for seven weeks of teaching. It also shows Thomas Starrett's signature in receipt of payment. In addition to Thomas Starrett, the document has the name of Walter Morse. Perhaps he was the town treasurer at the time. The Walter Morse that comes first to mind would have been rather young at the time, as he was born in 1794, but people matured earlier and took up civic duties earlier in those days. If this is the correct Walter Morse, he was the son of Levi and Mary Gay (Bradford) Morse. 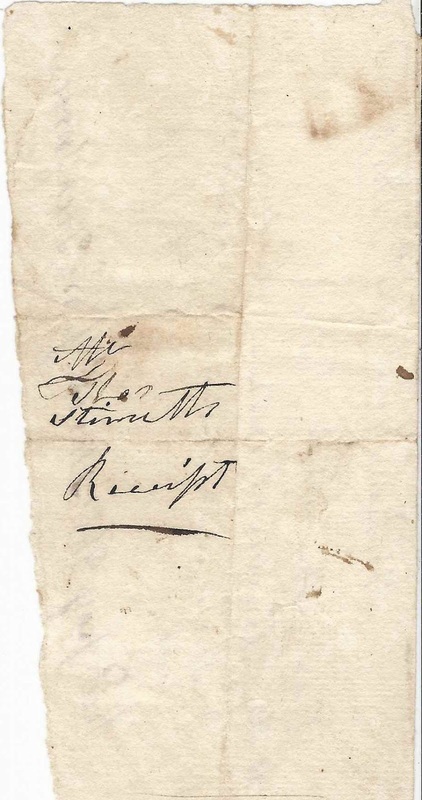 This blog earlier featured a document signed by Levi Morse. Walter died in 1825. As for Thomas Starrett, I found two possibilities, father and son, and there could be more. Thomas Starrett, Sr., was born 1738 at Warren, Maine, son of William and Mary (Gamble) Starrett. Thomas rose to the rank of colonel in the Revolutionary War. He died 31 January 1822. The second child born to Thomas Starrett, Sr., and wife Rebecca (Lewis) Starrett was Thomas Starrett, Jr., born 1765. According to the Annals of Town of Warren in Knox County, Maine, published in 1877 by Cyrus Eaton, Thomas Jr. served many years as the town treasurer, so it wouldn't be a stretch to think that he might have served as a teacher as well. Thomas Jr., married Anna Kirkpatrick. He built the "Singer House". Thomas Jr. died 24 July 1844. If you have corrections and/or additions to the information above, or if you feel that the names on the document belong to a different Walter Morse and/or Thomas Starrett, please leave a comment or contact me directly. Thanks!